Photos courtesy of the MSUcares website. At this time of the year [fall], many of us want to do more in the landscape than just rake leaves or pine straw. Why not take a survey around your home and see if you can use some rocks? Avid gardeners may have felt they had a good understanding of well-drained soil until . . . the rains came by the bucketfuls. People became keenly aware of water flowing in parts of the landscape, or worse yet, standing close to their home’s foundation and wishing it flowed away. You can turn this problem into a garden asset with the addition of a dry creek. A dry creek bed can flow as needed and is one of the hottest trends in Mississippi. I started noticing them in the Brookhaven area, but now they seem to have spread throughout the state. Even at our new office just south of Raymond, where the water flows off the roof fast enough to operate a small hydroelectric plant, the dry creek beds handle the water with ease and actually make the building and landscape more attractive. Whether as a patio for relaxation (left) or as a dry creek for directing runoff (below), rocks can turn a problem area at your house into an asset. 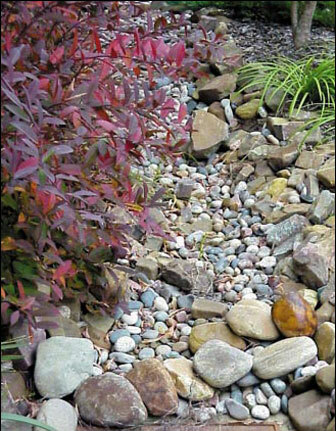 Whether you need to move water quickly away from the gutter downspout or perhaps have a winding snakelike low area across your landscape, you can create a dry creek with the addition of rocks and river pebbles. The first consideration is to remove the unwanted vegetation from the low area. Next, it is probably a good idea to line the bottom of the creek with a weed blocking fabric. Place the small river rocks in the bottom and larger rocks along the bank. Be sure to set a few large rocks randomly in the middle as well. Along the creek at the office, we used trailing juniper and the native Virginia sweetspire, Itea virginica, which presently has a fiery red leaf. In a more shaded bed, we have ferns, irises, and the tropical-looking fatsia. Another excellent and economical use of rocks is to create outdoor rooms using flagstones (see photo above). Flagstones are available in several colors, one of which is sure to complement your home. They also come in several sizes. Those with a more luxuriant pocketbook use flagstones with mortar and create patios, driveways and sidewalks looking as though they should be pictured in a magazine. Those with a more restrained budget still can set flagstone in the soil. The biggest consideration for the floor is making sure it is level. Since all the rocks are not the same size or thickness, the depth of the hole or indentation where they will be placed will have to vary, too. The first thought most designers have is that the rocks should be placed fairly close together. This can be a matter of taste. There is nothing wrong with a three- to four-inch spacing between rocks. This allows the use of plants like creeping thyme in between the rocks. Next to the wall of the house, you can create a room that may resemble a courtyard. Out in the landscape, it can be surrounded by evergreens for a private sitting area. I made a small courtyard at my home using about 1,400 pounds of a blue-gray flagstone. It was a fun project. I created pockets for perennials, used an iron trellis on the wall and an iron bench for sitting. If I can do it, believe me, anyone can. 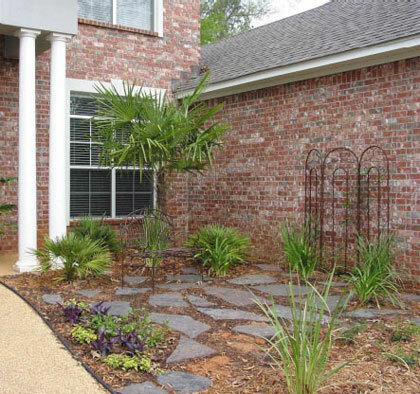 Look around your landscape and see if a few rocks can turn problem areas into assets, adding value to your home.